Everyone has a favorite salsa recipe. This is ours. Straight from Mexico. When Brent and I were first married almost 11 years ago, we lived in the basement of a family from Mexico. It was always a special treat when Josephina made salsa for us. This is her recipe. I watched her many times to get it just right. I was able to scrounge most of the ingredients from my garden, but it is time to replant cilantro. Blacken tomatoes and onion in a cast iron skillet*. Do this by adding no oil and allowing them to cook rather quickly with a slight blackening on the skin. Put all ingredients in a blender or food processor, excluding the tomatoes. Process for a minute or two. Then add tomatoes and blend a few seconds. Enjoy! 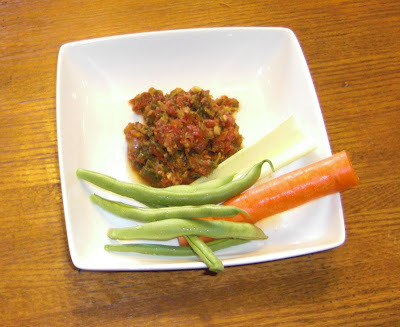 Try serving your salsa as salad dressing or as fresh veggie dip. My favorite! Brent and Callista still opt for the fresh tortilla chips though. *Remember cooking in cast iron, especially tomatoes is an excellent source of iron! I'm so glad you posted this. I need a good salsa. do you use a pinch of minced garlic or a pinch of garlic salt? Either one works great. Go for what is most convenient! Yum! I want to go buy the ing. right now!